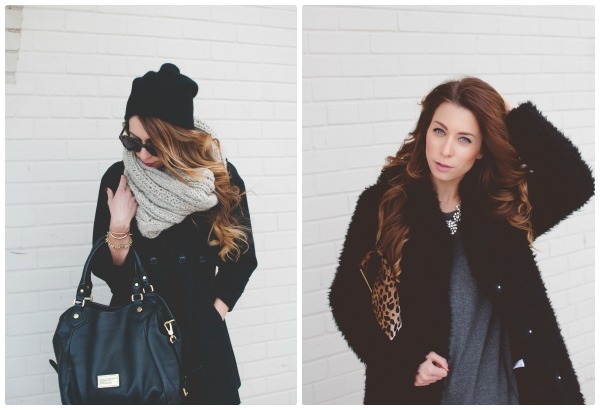 December 2014 | La Petite Noob | A Toronto-Based Fashion and Lifestyle Blog. What do you guys think about the faux-fur trend thats happening in a big way this season? I have totally embraced the trend, not only for it's vintage throw back but also for the fact that it's warm - something that we Canadians need! I will admit though I was a little sceptical of wearing faux-fur at first, and it definitely took some baby steps on my part to become comfortable with the trend. This faux-fur snood is the perfect way to ease into craze, and a nice way to have some fun with a traditional wool pea coat and some shorts and tights. Read on for additional photos and all outfit details. Brr - can you feel it? Old man Winter has decided to show up, and bring along the snow and cold weather with him! I touched on my difficulties during the Winter season in my last post, and for this post I would rather focus on the good! I had started blogging about a year ago around this time (there will be a one-year anniversary post soon! ), so the beginning of my blogging adventure started during the Winter months! I thought that I would round up some of my best posts - from fashion to cocktails to give you some Winter cheer! 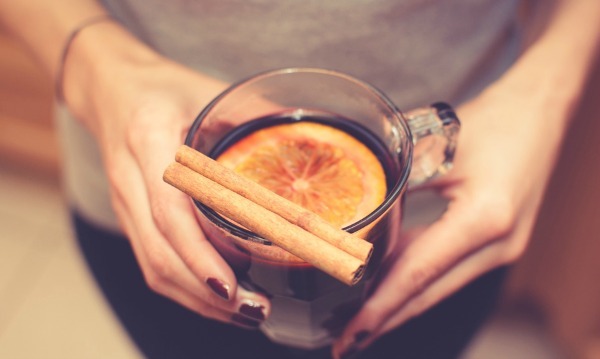 I shared one of my favourite winter beverage recipe - mulled wine! This warm, spicy and fragrant drink is a Winter favourite for me, and is perfect to serve to guests. Check out the recipe here! I also share some tips on how to dress for the holidays - for the conservative gal. Not everyone is comfortable being decked out in head-to-toe sequins and sparkles for the holidays - check out some tips and tricks for dressing the conservative girl for the holidays. This post is also strangely one of my most popular posts to date! I also started to experiment with posting outfit of the days (or OOTDs) last Winter. The look to the left is my Winter uniform a year ago and I'll be honest - it's the same this year! The outfit to the right is a dressed up Winter outfit, plus a pretty hilarious face - I was so serious a year ago! I hope you enjoyed this trip down memory lane! I honestly can't believe that this blogging journey started one year ago. I'm looking forward to my anniversary post, but until then - stay warm! I have a confession to make: I really struggle in the Winter time. The cold weather and the short days really take a physical, mental and emotional toll on me, and I have a hard time with finding the motivation to do anything. Some may simply chalk it up to the winter blues, but after experiencing this fatigue season after season I knew I had to break the cycle and really make an effort to experience happiness during the Winter. I have a few tips and trick that I rely on to keep my spirits up doing the frigid season. It may seem counter-intuitive, but I really make an effort to get outside during the Winter season. With daylight at a premium, I take every opportunity to absorb the sun's rays and get some natural Vitamin D when I can. The outdoor activity doesn't have to be anything too strenuous - sometimes, just getting out for a walk during my lunch breaks can mean the difference between a good or bad afternoon. 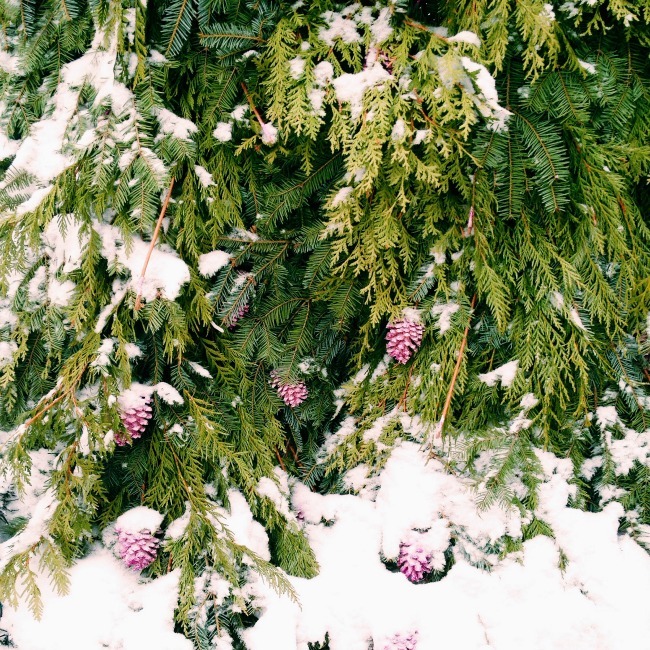 Wintertime can truly be beautiful, especially if you're in an area of the world that gets snow - like we do in Canada. While I'm making the effort to be outdoors, I also take the time to admire the natural beauty that surrounds me. I make a conscious effort to look past a slushy, dirty road and instead admire a snowy pine tree, or how the light catches icicles and makes them sparkle. Documenting the beauty of nature by snapping a photo or two on my phone doesn't hurt anything either - in fact, it motivates me to seek out these beautiful landscapes even more! 3. Hot Tea, Hot Chocolate, Hot Everything! As a self described gin and tonic kind of lady, I'm usually one to place a good cocktail above most other things in life - especially a non-alcoholic hot drink. That all changes in the wintertime, when I consciously limit my alcohol consumption and instead switch it up for a steaming mug of goodness. There is honestly something so soothing, and soul-warming about a hot beverage - particularly a good tea. I stock up on loose leaf tea and hot chocolate mixes in the Winter time and always indulge in a mug (or two) after work. A short day doesn't seem all that bad when you know a great cup of speciality tea is waiting for you at night. ...But if I am going to indulge in an alcoholic beverage, then I'll opt for a beautiful glass of rich red wine. Watching the snow fall outside while sipping a belly-warming glass of red is nothing short of heaven - and is something that is definitely Winter-specific. The Winter months can be lonely - cold weather, snow, bad traffic and dark nights can make it difficult to spend time with friends and family. During the Winter I try to make a conscious effort to fill my day planner with as many activities as I can - and commit to actually keeping them. It may take all of the willpower I have to meet up with a friend after work, when it's already dark out and all I want to do is nap - but when I do, I never regret it. Winter can make you feel isolated, but all it takes is a good laugh or conversation with a friend to connect you with the world again. Now you know the five ways that I keep the Winter blues away. Do you struggle with Winter as well? What are some of your tips for keeping happy in the Winter time? Ahh weekend afternoon style - or lack thereof in many cases. I don't know about you but on a weekend afternoon, between pyjama-clad mornings and dressy nights out, I'm happy in a comfortable pair of leggins. 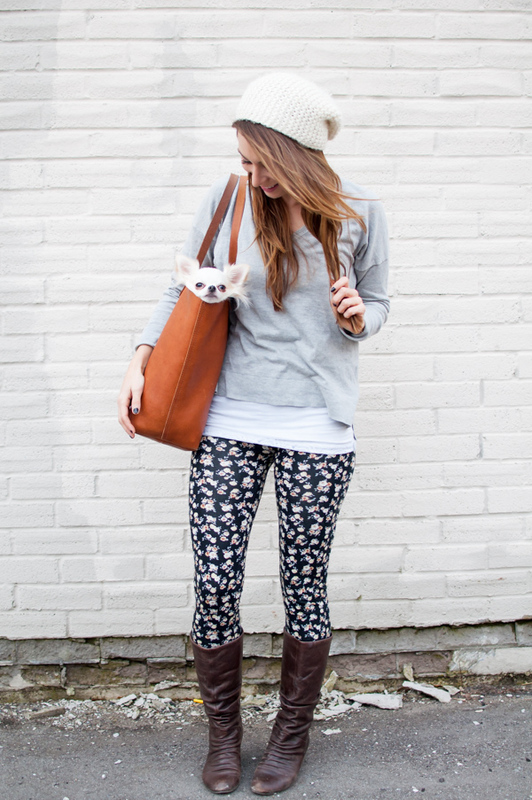 These floral leggings have been pulling double-duty as pyjamas and errand-running attire - they're comfy enough for lounging, and the pattern adds a little something to an otherwise plain outfit. Read on for additional photos and all outfit details. 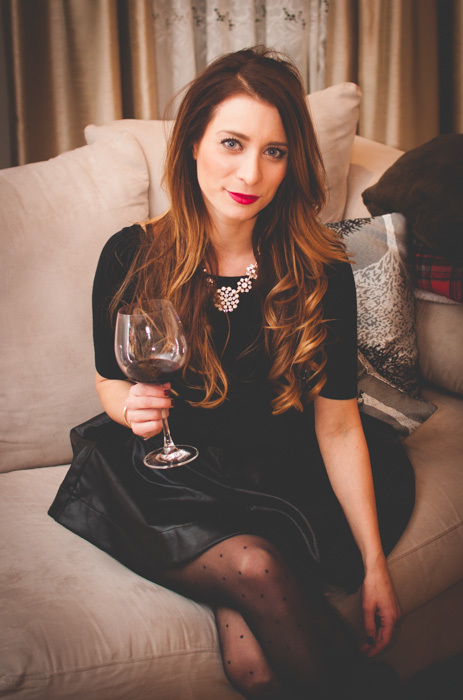 The holidays are just around the corner, and I'm here to share a few of my favourite holiday gifts, based off of items that I love all year round and think are incredibly practical for any gal on your list! 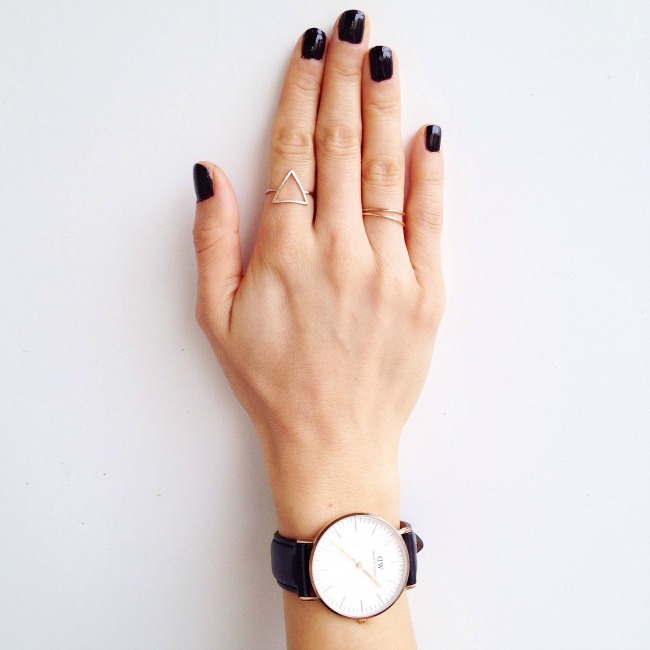 The first is, of course, my beloved Daniel Wellington watch. I honestly can't say enough good things about this baby, and have re-fallen in love with it since switching up the leather band. Now instead of the rich brown St. Andrews watch strap, I'm loving the moody black Sheffield strap - especially paired with the gold details on the face of the watch. I would definitely recommend gifting one of these gorgeous watches to a lady on your list, especially if she has small wrists and struggles with finding a watch that fits. If you're thinking about a Daniel Wellington watch, use code 'Holidays_lapetitenoob' to get 15% off your entire order - plus free worldwide shipping! West Elm: My first breakfast tray was from West Elm, and it's still one of my favourites. Their trays are quite small, so they're great for decorating small spaces or for preparing an espresso and cookies for one. Chapters Indigo: The gold breakfast tray that you see from the photo above is from Chapters, and it's become my favourite. This particular tray is a tiny bit bigger than the West Elm version, making it a bit more practical for breakfast in bed. 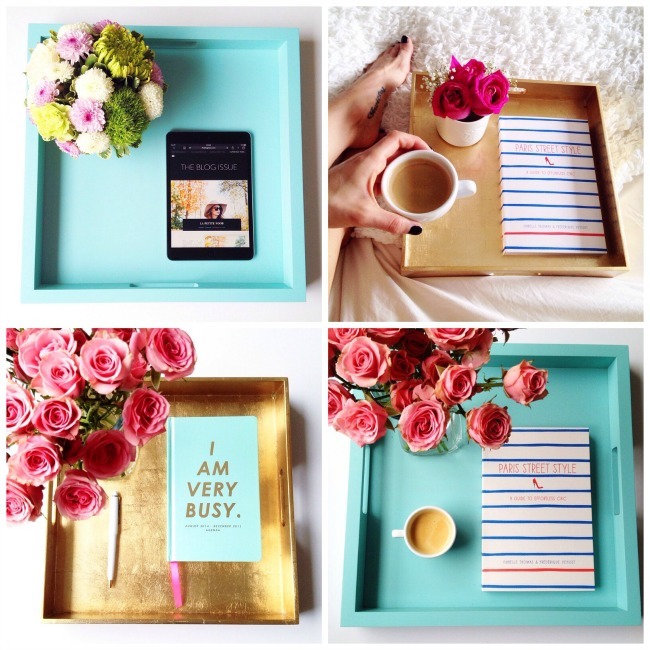 Crate and Barrel: The sky-blue tray that you see in the photo is from Crate and Barrel, and it's definitely the largest of the three by far! I use this tray in bed when I'm preparing breakfast and coffee for both Brian and it also fills out a coffee table nicely. My gift-giving technique around the holidays is to share my favourite things with the ones I love most. What are some of your favourite things to give as gifts? Ah wintertime - the mother of all curve ball seasons for fashion and style. I always find that I have to put a lot of extra effort into dressing during winter to avoid living in a parka all season. Date nights seem to be the most challenging for putting together outfits - it's a fine line between dressing up, staying warm and looking season-appropriate. Patterned tights are my number one go-to for getting gussied up in the winter, as well as a flirty skirt in an interesting material. I like to add a statement accessory, and for this particular outfit it's a beaded headband that it's super easy DIY. There's also a surprise at the end of the post - two more outfits from two super talented bloggers to add inspiration for your Winter date night looks! Read on for all outfit details, and to see how Kristiana and Emily styled their outfits.